Financial institutions report interest income on Form 1099-INT. 1. Do You Have to Claim Tax-Exempt Interest Earned? 2. Do I Have to Pay Taxes on My Savings Account? The Internal Revenue Service considers all income that is not specifically exempted by law from taxation to be taxable income. A significant portion of income received by Americans is interest income. While some interest income, such as the interest on most municipal bonds, is exempt from federal income taxes, most interest income, including the interest on certificates of deposit, is fully taxable. You have to report and pay taxes on any interest from your CD, even if the CD has not yet matured. Gather your financial records. Each financial institution that paid interest to you should provide you with a Form 1099-INT by Jan. 31. Form 1099-INT details the amount of interest paid, the amount of any early withdrawal penalties and any federal income tax that was withheld. You are responsible for reporting interest income on your CDs even if your financial institution did not furnish you with a Form 1099-INT. If you don't receive a Form 1099-INT, contact your financial institution and ask how much interest your CD earned for the tax year. You are responsible for paying taxes on any interest that was credited to the CD and available to you during the year. 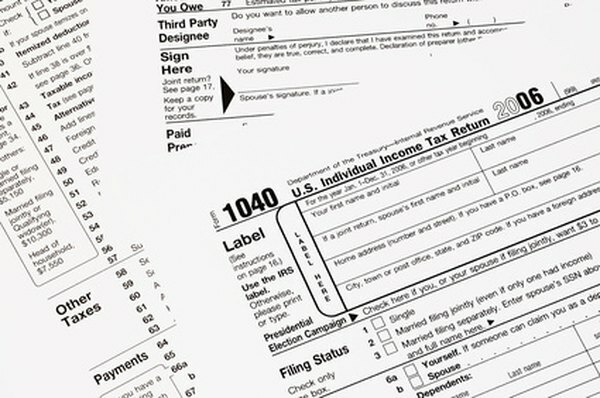 Determine which version of Form 1040 you need to use to file your federal income tax return. Your options include Form 1040, Form 1040A or Form 1040EZ. You can't use Form 1040EZ if your total interest income exceeded $1,500 for the year. You can use Form 1040 only if you forfeited interest due to an early withdrawal. Use the information from your 1099-INT forms and any additional information regarding interest payments that was not reported by your financial institution to complete Schedule B. List your interest income from all sources, including your CD interest, in Part 1, Section 1 and total the amounts on Line 2. Report any excludable interest from series EE and I U.S. savings bonds on Line 3. Subtract the amount on Line 3 from Line 2 and report the amount on Line 4. Transfer the amount from Line 4 to Line 8a on Form 1040 or 1040A, or Line 2 of Form 1040EZ. If you received more than $1,500 in interest you must also complete Part III of Schedule B. "The Wall Street Journal": What Is a Certificate of Deposit (CD)? Are There Tax-free United States Treasuries? What Minimum Amount of Interest Does a Savings Account Have to Have to Issue a 1099-INT?